Usually the flowers for these occasions are just used for the one day and then they are tossed. Instead of letting these beautiful bouquets just wither and die, please consider donating them to the Power of Flowers Project. Just this one simple act of kindness can make so many people happy. It’s easy. Just fill out the form on our website. 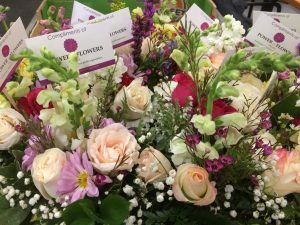 On the form you indicate whether you’d like us to pick up the flowers at the event venue or whether you’d like to drop them off at our workshop in the Tewksbury Hospital Campus. We recommend that you call us first to make sure someone will be there to accept the arrangements and volunteers can begin processing them immediately. When flowers come into the POFP Workshop, volunteers quickly begin dismantling the arrangements and revitalizing them, putting them into fresh water and then into one of our huge coolers overnight. Other volunteers now have an outstanding array of blossoms to work with sorted by color and type to arrange into our POFP small signature bouquets. 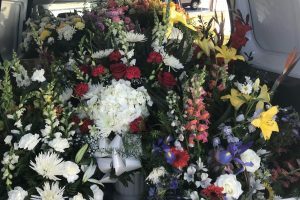 These smaller bouquets are then delivered to individuals in the community who are in need of a smile… nursing homes, hospitals, VA facilities, shelters for homeless mothers, Meals on Wheels programs, and community meal sites. 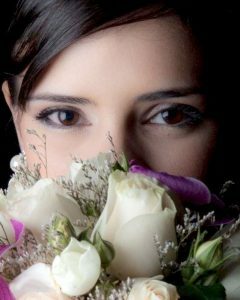 One large commercial flower arrangement becomes several smaller bouquets. Typically, we deliver about 400 bouquets to the community each week. In fact, we are getting ready to celebrate the delivery of our 100,000th bouquet since 2009. That’s a lotta flowers making a lotta people happy! So, if you’re the bride or groom, a family member, an event planner, a florist, or a venue you can do so much good by donating the flowers from your event. To learn more about The Power of Flowers Project, check out our website https://pofproject.org/. To donate flowers, click Contribute and scroll down to Donate Event Flowers and click the Donate Event Flowers button.